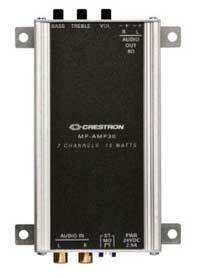 Crestron has introduced the MP-AMP30, a low-cost audio amplifier designed for environments in which audio equipment is connected directly to the projector. The MP-AMP30 amplifier drives the audio signal from sources directly to external speakers. It can be used as a stand-alone amplifier or can be used with equipment in the Crestron MPC line of controllers and wall plates. The MP-AMP30 is compact, so it can also be surface-mounted. Crestron said high-efficiency Class D circuitry delivers 15 watts per channel to drive one or two pairs of 8-ohm speakers or a single pair of 4-ohm speakers, supporting stereo speakers at the front of a room or mono versions in the ceiling. The MP-AMP30 has detachable output connectors for simple termination of speaker wiring, as well as RCA inputs that connect directly to the line output of a video projector or display, audio processor, mixer, or AV switcher. Rotary controls enable adjustment of overall speaker volume, as well as bass and treble. In addition, it dissipates heat, so there is no cooling fan or associated ambient noise.